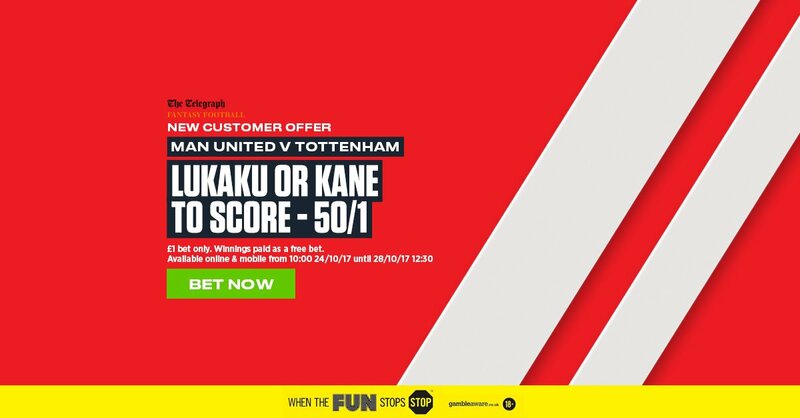 Manchester United and Tottenham lock horns on Saturday's blockbuster match and Ladbrokes are offering a tasty offer - 50/1 for Romelu Lukaku or Harry Kane to score a goal, plus money back if you lose! Romelu Lukaku has not found the back of the net in his last 4 competitive outings but the Belgian striker has already netted 7 goals in Premier League so far. Harry Kane is arguably playing the best football of his career and scored a brace in his last outing against Liverpool. Don't miss this great offer! 50/1 for Harry Kane or Romelu Lukaku to score a goals ia real bargain! Join Ladbrokes via our special links and claim 50/1 on Romelu Lukaku or Harry Kane to score! 3) Place a single bet of up to €/£1 on Romelu Lukaku or Harry Kane to score at normal odds in the Malta v England anytime goalscorer market before the kick off. 1. Offer available to new Ladbrokes Online & Mobile customers: Simply register today, deposit a minimum of £/€5, and place your first bet as a single bet of £/€1 on Lukaku or Kane to score (50/1). "Man UTD v Spurs - 50/1 Lukaku or Kane to score at Ladbrokes + money back"